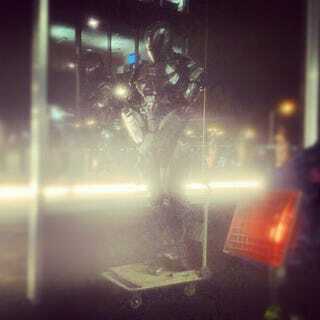 Our first glimpses of the suit from the new Robocop remake didn't blow us away exactly, with their "Bat-armor" vibe. Luckily, a new set photo reveals a very different version of Robocop's suit. Check out Robocop's "combat mode." Over at Bleeding Cool, Brendon Connelly speculates that the Robocop armor goes through many different stages, judging from an early draft of the script that was circulating a while back. Early on, a focus group in the film deems the Robocop armor too much like a 1980s toy, so the armor keeps getting tweaked and made more impressive-looking over the first hour of the film. And the final version has the Transformer-esque ability to shift from "social mode" to "combat mode." So what we're seeing in the above image might be "combat mode." The set photo above comes via Davor Mazumic, who tweeted it yesterday.